Move Chico Forward With Us! Connect, Learn and Make a Difference in Our Community! 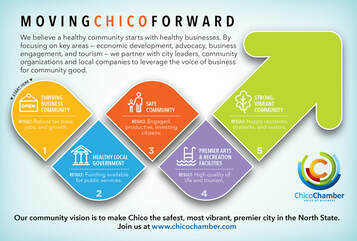 The Chico Chamber of Commerce released a Chico Community Vision to the Chico City Council in fall 2015. This vision outlines our standards and expectations for a safe community, a healthy city government, thriving anchor businesses, vibrant shared spaces, and premier facilities and community amenities. It outlines common goals that will move Chico forward. Chamber partnership and membership now mean standing together to achieve a common vision for Chico that meets all of our expectations. We are certain that the Chamber, along with our members and partners, will make a difference in this community for the better, and it all starts with our Community Vision. Click here to complete your online application! We ask our members to adhere to the Chico Chamber of Commerce Code of Conduct.